Photos by Tom Rivers: Josie Waverly, center, leans on Gina Sidari, the daughter of Amy Sidari, left. 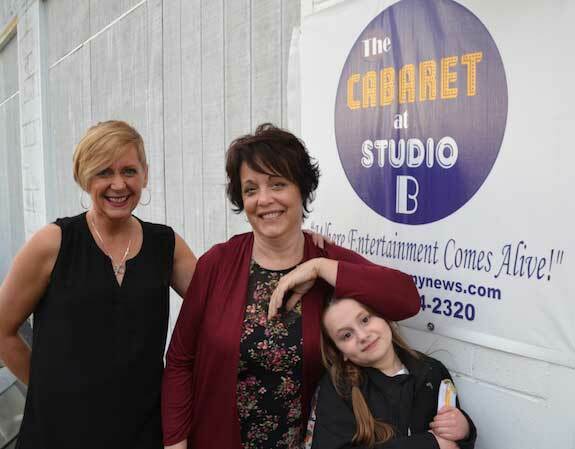 Waverly will be performing on June 30 at the Cabaret at Studio B, which Sidari runs on West Bank Street in Albion. Waverly of Hilton has performed there several times. She has performed all over the country as a headliner as well as an opening act for many of Nashville’s leading entertainers such as Tim McGraw, Charlie Daniels, Loretta Lynn, Rascal Flatts and Keith Urban. 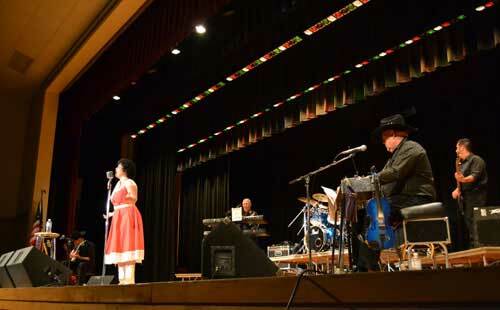 Josie Waverly portrayed Patsy Cline during a concert at Medina High School on July 20, 2013. About 150 people attended the event, which was a fundraiser for the Shelby Volunteer Fire Company. ALBION – Josie Waverly of Hilton was on her way to Albion to sing in a benefit concert on Dec. 3, 2016 when she was rear-ended at a stop light at Redman and Ridge Road in Clarkson. Waverly would suffer herniated disks in her neck and back. The injuries have made it hard for her to take in the deep breaths for singing her country music. Waverly has had to cut back on her performances. She used to hit the stage 200 times a year. Now she is performing about 50 times a year, including an upcoming concert on June 30 in Albion at the Cabaret at Studio B. It will be her first time performing in Albion since the accident. Waverly has been diligent in physical therapy and exercises which has allowed her return to singing. This is her 30th year singing as a professional. She is dubbed as “New York State’s Queen of Country Music.” She has performed in the Grand Ole Opry in Nashville and opened for major country music stars, before crowds of 20,000 people. She has opened for Tim McGraw, Charlie Daniels, Loretta Lynn, Rascal Flatts and Keith Urban and many others. Waverly said she gives every performance her all, whether it’s for the 20,000 at a major concert venue or much-smaller venues. The Cabaret at Studio B seats about 100 and Waverly said she likes the intimate setting, where she can chat with some of the concert goers. 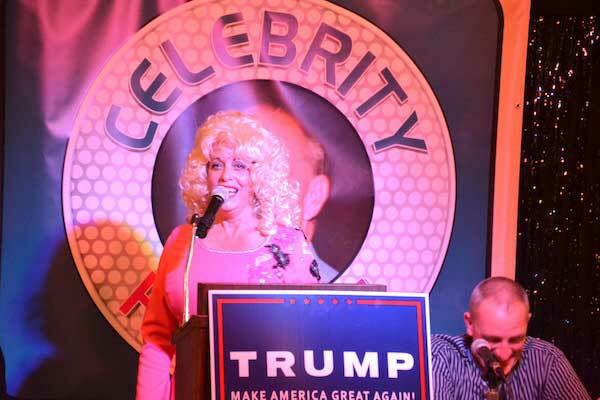 Josie Waverly performed as Dolly Parton during a benefit on Oct. 15, 2016 that was a roast of local contractor Jim Babcock. Waverly performed a spoof of the Parton song, “9 to 5,” in describing a kitchen repair gone wrong. With her “Queens of Pure Country” show, Waverly sings songs from nine famous entertainers, such as Dolly Parton, Kitty Wells, Tammy Wynette, Loretta Lynn, Dottie West and Reba McEntire. Waverly, an active grandmother to five grandkids, said staying away from the stage wasn’t an option. “I have to stay singing and doing what I love to do,” she said. Amy Sidari, owner of the Cabaret, has become a close friend for Waverly, and is working as Waverly’s publicist and promotions agent. Sidari is working on bringing about 20 shows to the Cabaret this year, which is in its sixth season. Sidari has a long-term goal of opening a bigger performance venue in the second floor at 28 West Bank St. When people call for tickets for some of the shows at the Cabaret, they often ask how Waverly is doing since her accident. Sidari is pleased Waverly will be back in Albion on June 30 and then again on Dec. 15 for a holiday concert in her Patsy Cline character. “It’s a treat for the Albion community to have someone of Josie’s caliber,” Sidari said. 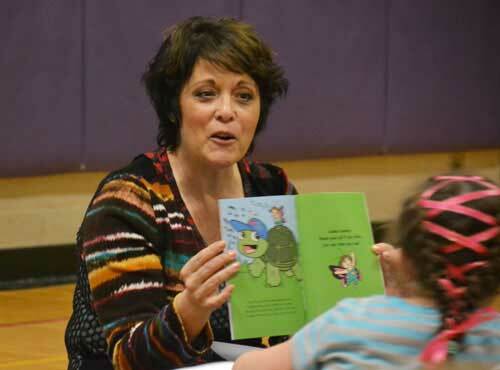 Josie Waverly, a popular local singer, is also a children’s book author. She has written three children’s books about Josie the Butterfly. She visited Albion on March 30, 2016 to share the story of “Josie the Singing Butterfly” and to promote early childhood literacy.